Just a Dash! We've all heard you simply add a dash of this or a smidgen of that but what the heck is a dash or a smidgen? How do you know how much to add? With the Stainless Steel Pinch, Dash and Smidgen measuring spoons, now you'll know how much to add to your recipe. Easy to use and even easier to clean, this set of three stainless steel measuring spoons would be a great addition to any cooks collection. Measuring spoons include these measurements: dash, pinch, and smidgen. Fun yet useful, 5 stainless steel measuring spoons. Set includes; tad, dash, pinch, smidgen and a drop. Measures 5" /13cm. Dishwasher safe. Pour liquids, sauces, purees, glazes, batters, frostings, dressing and gravies with no drip precision. 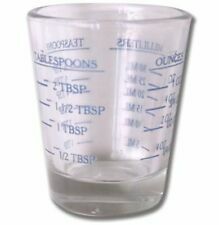 Kitchen Craft Glass Medium Measuring Cup - ml, Teaspoon, fl oz, Tablespoon. The KichenArt Adjust-A-Cup is constructed from a durable plastic, that is dishwasher safe. 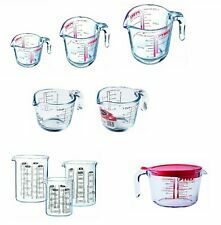 The adjustable measuring cup makes it easy to get the precise measurement needed for liquids, dry goods, and semi-solid, simply twist and push and the extra leaves the container. 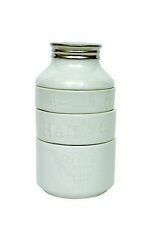 The mini adjust-a-cup has a one ounce capacity and measures in tablespoons, teaspoons, and milliliters. Homemade salad dressings are better and this salad dressing genie makes it easy. Just pick a dressing, fill to the lines and shake. Also ideal for sauces and drinks. Capacity, 2 cups/500ml. Measures, 8 inch/20cm. Dishwasher safe- top rack. BPA free. This Ancho Hocking Five Ounce Measuring Glass features four measurement systems, in red. Both functional and stylish this measuring glass is a perfect addition to your kitchen! This high quality 2 ¼ x 3 ½ inch measuring glass is dishwasher safe and is made in the United States. 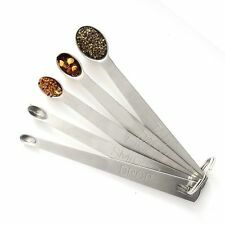 Grip Ez measuring spoons will accurately measure your spices, sugars, baking powders and more. With a sleek, round shape, you can easily reach into any container. Level rims allow for precise measurement. Features strong, comfortable grips for easy right and left hand use. 6 piece set includes 1/8, 1/4, 1/2, 1tsp., 1/2 Tbsp. and 1 Tbsp. sizes. Hand washing recommended. 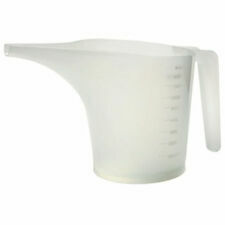 Kitchen Craft Glass Mini Measuring Jug - ml, Teaspoon, Shots, fl oz, Tablespoon. KitchenArt's Pro 1 Cup Adjust-A-Cup measures metric or standard for liquids, dry and semi-solid ingredients, like honey, peanut butter, shortening, and butter. To use simply pull the plunger down to the measurement indicated and add your ingredient. For best results, hand wash the Adjust-A-Cup with a sponge and warm soapy water. This cup measures up to 4 cups and is constructed of food safe plastic. For your convenience it also has metric equivalents. Dishwasher safe and BPA free. Spoon Length: 17cm / Clipper: 8cm. Keep coffee fresh and tasty by clip the coffee bag after use. Suitable for Coffee Machines & Instant Coffee. Built in Bag Clip. Material: Stainless Steel. Accurately measure ingredients with this versatile measuring cup! 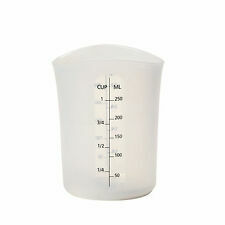 Durable and easy to use, this cup is ideal for precisely measuring dry ingredients, but is also suitable for liquids. Cup includes a stable base to prevent spills and a comfortable handle for easy transportation. 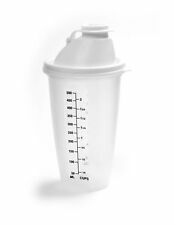 Made of durable plastic, this cup is easy to use and is translucent for precise measurement. Works for right or left hand use. Measures up to 1c/8oz. The built-in magnet holds spoons together neatly in the drawer while also allowing them to easily separate for use. The narrow spoons are perfect for most spice jars and the round spoons are excellent for liquids. These Magnetic Measuring Spoons rest flat on the counter top allowing you to set a filled spoon down without spilling the contents. Easy to read standard and metric measurements. 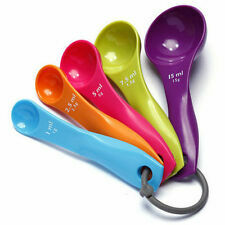 5 piece measuring spoon set includes: 14 tsp, 12 tsp, 1 tsp, 12 Tbsp, and 1 Tbsp. Double-ended measuring spoons give you two sets in one. Dishwasher safe. Baking & Preserving. 2L Capacity. Ideal for mixing ingredients. Food Storage. Plumbing Tools. Plumbing Miscellaneous. Fitness & Exercise. Sport & Exercise. Fox Run's mini glass measuring cup has a four ounce capacity with markings indicating milliliters, teaspoons, and tablespoons. The glass construction and easy to read markings make measuring out small increments easy. The thick walled glass is durable and easy to clean, hand washing is recommended. 1, 1/2, 1/3 and 1/4 cup. 60ml, 80ml, 125ml and 250ml. Available in Mini, 250ml, 500ml and 1 Litre versions. Dishwasher safe. The handle is soft and non-slip for a firm grip. · Quarter teaspoon (1.25ml), Half teaspoon (2.5ml), Teaspoon (5ml) & Tablespoon (15ml). · Clipped on a key ring so you do not lose one. We are here to help. This is because when occasionally there has been a problem I have always tried to sort it out! the more the reduction. This will be done asap but within 24 hours. If an item that is too large to go through your letterbox does not arrive, I will ask you to go to your local sorting office. STAINLESS STEEL. Stainless Steel. 1 Table spoon - 15ml. Cooking and baking can already be laborious despite searching around the kitchen for specific measuring spoons and cups. KitchenArt elegantly solves the problem with adjustable measuring tools. The Professional Series Adjust-A-Tablespoon measures in increments of: ½tsp, 1tsp, 1 ½tsp, 2tsp, 2 ½tsp, 1tbsp. The sliding cover catches at appropriate measurements, for liquid measure - press thumb to form a seal. Top rack dishwasher safe. Always remove slider before washing. Pour over your fresh green salad and enjoy! Create your own healthier salad dressings and pour the perfect serving size! Sensible portions help in losing or maintaining a healthy weight! The glass features large marking and is easy to read. Compact and versatile. Large markings are easy to read. LONG HANDLE CONVENIENTLY REACHES THE BOTTOM OF A JAR. Maximum 30 ml or 1 fluid ounce. Also if you have any concerns about late arrival of your item, we are happy to help. 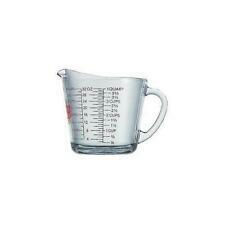 First Choice Measuring Jug Set. 3 Piece Measuring jug set with silicone grip handles|200ml, 400ml & 900ml jugs in the set|Dishwasher safe . Classic wooden design brings simple refined elegance to any kitchen setting. Overall size is 10 x 2.25 x. 25". - Never cook too much spaghetti by mistake again. Be sure to add us to your favorites list, as we continually add new products. Spoons are approx 13cm (5") long. the more the reduction. This will be done asap but within 24 hours. This is because when occasionally there has been a problem I have always tried to sort it out! Quarter Teaspoon = 1.25 ml. Highlights: Color: Black Easy to read Measures: Teaspoon, Tablespoons, Ounces Ideal for: Home, lawn, garden & kitchen Dishwasher safe glass Premanent marking High base reduces tipping. Frieling Emsa Perfect Beaker. Mix salad dressings, healthy drinks or flour mixtures for breads. A beveled rim makes pouring easy. Ideal for liquid or dry ingredients. Masterclass Stainless Steel Measuring Spoon Set of 6 - ml, Teaspoon & Tablespoon. 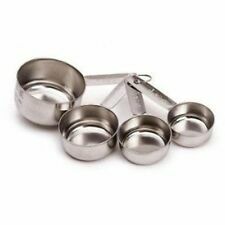 Paul Hollywood Bakeware Set of 3 Stainless Steel Measuring Cup Scoops / Spoons. Whimsical piggy design, these useful gadgets and gizmos make baking and cooking easier and fun, and bring more joy to the task. Great kitchen gadgets for clever gifts and kitchen decorations, too! Made from durable, BPA-free, FDA-approved plastic.